This company is better known for its commercial vehicles which have been made from 1918 to the present day. In recent years, they have concentrated on ultra-large, off-road dump trucks. 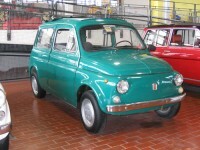 Italy had many small specialty car manufacturers in the 1960s and 1970s. Many small car makers used drivetrains from Fiat. 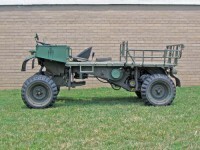 This vehicle is based on a Fiat 500 drivetrain, with Fiat 600 transmission. Presented at the 1966 Turin Motor Show, the Ferves (Ferrari Veicoli Speciali) Ranger is an attractive, compact all-terrain vehicle. The charter establishing Fiat was signed in 1899. A year later, the factory opened and produced 24 cars in the first year. By 1908, Fiat had expanded throughout Europe and the U.S. World War I began and production focused on supplying the army. 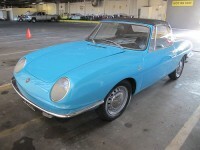 The Fiat 124 entered the market in 1966 as a mid-level sports car. Designed to compete with the MGB, it had superior technical specifications – a dual overhead cam engine and 4-wheel disc brakes. From all outside appearances, this is a normal Fiat 500. What makes this car different is it's powered by a 245cc Goggo engine. It was created to allow German drivers with a Class 4 license to drive a car. The 500 Abarth is a sporty addition to Fiat’s successful reboot of the classic Fiat 500. Building on the successful base model, the Abarth features significant power increases, suspension upgrades, and nicer interior appointments. This nice little Fiat conversion is but one of several designs by Giovanni Vernagallo of Torino, Italy. 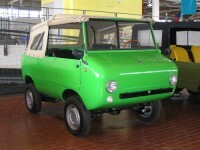 Vernagallo’s company, Carrozzeria Holiday, takes cars such as the Fiat 500 and Punto, Citroen 2CV, Saxo, and AX, and Renault Twingo, among others, and transforms them into beach cars, cabrios, or pickups. The next major version of the Fiat 500 to be released was the “Giardiniera.” Introduced in 1960, this was an estate version, with a stretched wheelbase and a horizontally mounted engine. 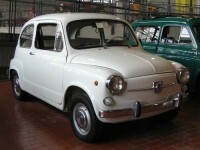 In 2003 Fiat decided it was going to re-introduce the popular Fiat 500 that had ended production in 1975. It took years of planning and development to get the new Fiat 500 into production in 2007. This station wagon body was introduced with the 500 B in 1948. This later Belvedere, or steel wagon, was a very popular model of the redesigned C Series. 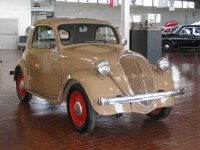 In 1936 Fiat introduced the 500, or “Topolino” as a small car for the masses of Italy. The car seen here is a “C” model, and it is basically a station wagon model without windows. At first glance this looks like an ordinarily plain Fiat 600. 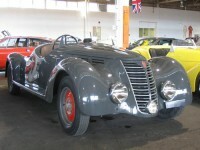 Although the car is ordinary, the owner and the story behind it is special. When it was time to replace the Fiat 500, many engine and chassis configurations were designed, built, and tested. The layout for the 600 was chosen for a simple reason –low manufacturing costs. Following the introduction of the 850 Sedan in 1964, Fiat debuted the 850 Spider two-seater convertible in 1965 to compete with the MG Midget and Austin-Healey Sprite. While the Sedan and Coupe were styled and built in-house by Fiat, the Spider was designed and built by Fiat’s frequent stylist and carrozzeria (coachbuilder) Bertone.